has been a lifelong resident of Eastern Ontario, enjoying an ideal country life with horses always standing in a field close by. In the late ‘90’s she and her husband transitioned from a working dairy farm to cash crops, while raising two fine sons and running a thriving Heating, Ventilation and Air Conditioning business in Westport, Ontario. Around this time, Cindy and her family purchased their first Shire mare and began to breed and raise these rare draft horses. Their homebred Shires have been successfully shown throughout North America and have often been a crowd favourite at local fund-raising events. As members of the Canadian Shire Horse Association, Cindy and her husband are dedicated to keeping this breed of gentle giants alive. Besides her business and farming ventures, Cindy is an accomplished author, specializing in short stories and flash fiction. Her stories have been recognized both nationally and internationally. After many years of enjoying her own time with horses, Cindy was drawn to pursue training in Facilitated Equine Experiential Learning (FEEL) on the recommendation of a dear friend. 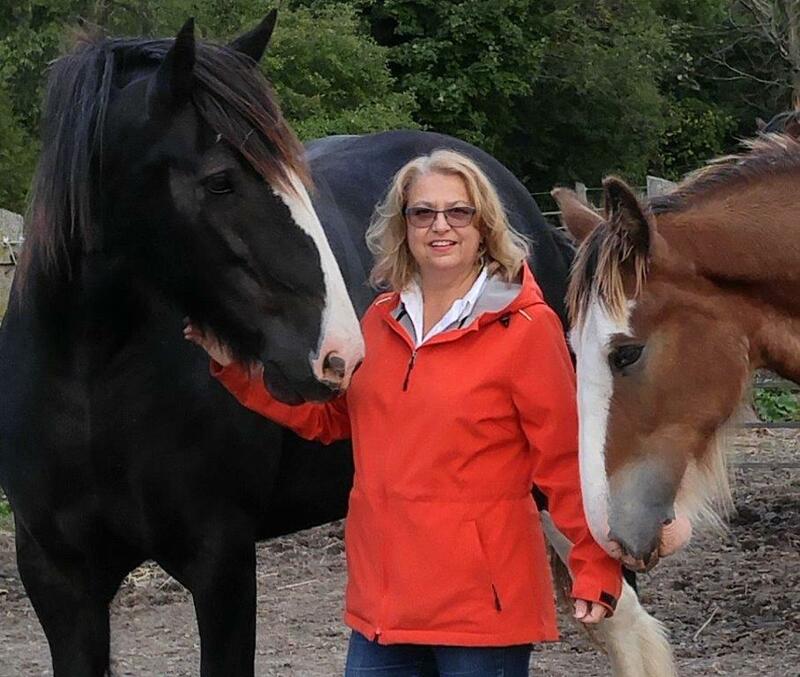 Completing the FEEL program offered by Horse Spirit Connections®in Tottenham, ON in 2018, she and her herd of eight horses are now excelling in their new roles. Combining the strength of a massive draft horse with their genuine friendly nature, the horses are helping clients to discover the possibility of positive change. No longer just “Field Art”, the horses have truly embraced helping others, and Cindy is following a new path which offers so much more than harness, ribbons, feather and fetlock. A shift to rekindled intuition, mindfulness, emotional awareness and wonder at the world.